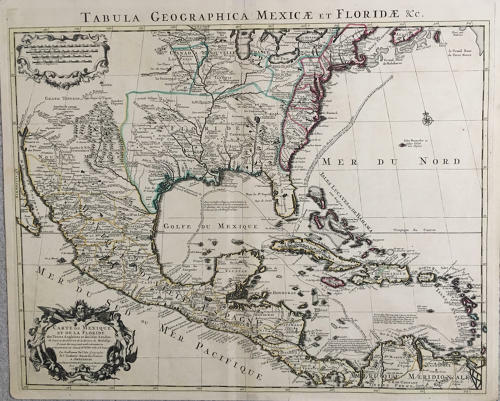 Title: 'Tabula Geographica Mexicae et Floridae &c. Carte du Mexique et de la Floride, des Terres Anglaises et des Isles Antilles, du Cours et des Environs de la Riviere de Mississipi'. An important map of colonial North America from the Great Lakes in the north, and including Mexico, Central America, the Caribbean, Baja California and Venezuela. The central U.S. is labeled “Floride,” the northern region by the Great Lakes “Canada Nouvelle,” and the Southwest “Nouvelle Mexique.” Mexico is “Mexique Nouvelle Espagne” [New Spain]. Many decorative elements include forts, Native American settlements and other geographic information. This map, published by Covens and Mortier, was a re-engraved version of a 1703 map credited to Guillaume de l’Isle but actually engraved by his father, Claude, also a cartographer. Based on sources including d’Iberville, the explorer Le Sueur, and John Lederer’s names for Indian villages, it was the first printed map to accurately show the mouth of the Mississippi River and the delta. The Missouri River is also shown. Guillaume de L' Isle, appointed Royal Geographer in 1718, was the leading French cartographer of the early 18th century, and certainly among the most influential. He was known for his prolific output -- over 100 maps -- and his exceptional accuracy. From his first atlas, published at age 25, De L’Isle made an effort, unprecedented in his era, to base his work on verifiable, current data and to correct prevalent fallacies, such as the depiction of California as an island. His maps and atlases were frequently reissued after his death by Philippe Buache, Phillippe’s nephew Jean Nicolas Buache, and J.A. Dezauche. The Amsterdam publishers Covens and Mortier also reissued de L’Isle maps. De L’Isle maps served as inspiration for derivatives by various other cartographers including Jeremias Wolff and Matthäus Seutter. Covens and Mortier was an Amsterdam firm formed in 1721 by Johannes Covens in partnership with the heirs of Pierre Mortier. Mortier, a Frenchman, had established a publishing house in Amsterdam by around 1685 and published or reissued maps by some of the great French and Dutch mapmakers of the late 17th and early 18th centuries, including Guillaume de L’Isle, Carel Allard and Jan Jansson. After Mortier’s death in 1711, the family continued the business and then joined with Covens. Covens and Mortier issued several atlases, including its major work Atlas Nouveau, published in nine folio volumes between 1711 and 1760. The firm also issued world and continent maps. In very good condition, mild overall toning, with ample margins and original colour.